“I have a past but it is checkered. Equal parts Spiderman, Brady Bunch and sitting restlessly on my kokum’s couch while all the grown-ups laughed and talked in Cree. I’ll be honest, I really wasn’t sure what to expect when I was asked to cover Michael Greyeyes’ keynote manifesto on staging ethnicity at the Vancouver 2012 PuSh Festival. To me, Michael Greyeyes represented an idealistic type of Native masculinity found only on the silverscreen. He’s stoic, he’s handsome, he’s brave. 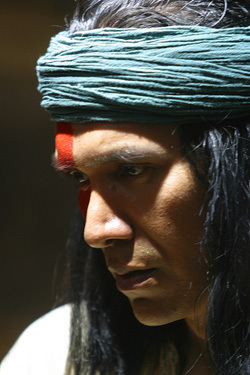 But what I soon discovered is that Michael Greyeyes is far more than a one-dimensional cinematic stoic Indian. Greyeyes got his start at the age of ten as the first Aboriginal boy to attend the National Ballet School of Canada; one Toronto newspaper dubbed him the “Indian Boy with Dancing Feet”. 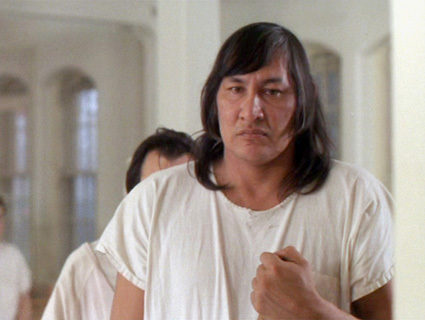 After much success as a dancer and choreographer, he went on to also find success as actor playing roles such as the legendary Lakota warrior, Crazy Horse, and the tortured ex-con, Gooch, in Bruce Macdonald’s “Dance Me Outside”. Today, along with being a decorated veteran performer and artist, he is also a theater director, an associate professor in York University’s Department of theater, and a loving family man. Greyeyes was at this year’s PuSh festival both to accompany his most recent directorial piece, “Almighty Voice and his Wife” (produced by Toronto’s Native Earth), as well as to open the festival with a keynote speech entitled “Staging Ethnicity: A Manifesto for Yesterday”. 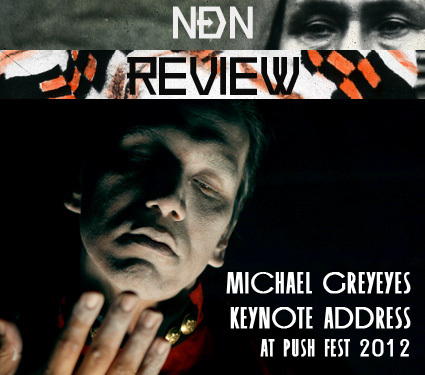 The PuSh Festival aims to showcase “work that is visionary, genre-bending, multi-disciplined, startling and original”; as far as keynote speeches go, Greyeyes’ keynote manifesto was all of the above. It was equal parts theatrical and outrageous as it was subtle and intellectually engaging. He began with a story about young love, Saskatoon’s annual summer FolkFest and the girl that got away. The story chronicled his attempts to gain the courage to speak to the beautiful girl across †he room over †hree summers at the Folkfest. As I listened, I kept thinking “Where is he going with all of this? When’s he going to get to the whole staging ethnicity subject?”; then, unexpectedly, he pulled out a pint of beer from behind the podium and nonchalantly took a sip, just as he would have all those years back in the American Pavilion at Saskatoon’s Folkfest. As I looked around, I saw that he had the audience’s deepest sympathies as he recounted the bittersweet story of his teenaged fears getting the best of him and his inability to approach this beautiful girl. They laughed, they cried (mainly due to the laughter), and they “oooh’ed and aaah’ed” in all the right places. There I sat, for the first time in my life, watching a First Nations man drink a beer on stage and it had nothing to do with alcoholism, internalized oppression, intergenerational trauma, or any of the other prescriptive descriptives we all hear associated with Indigenous peoples and substance abuse. It finally dawned on me, Michael Greyeyes was staging the Indian. 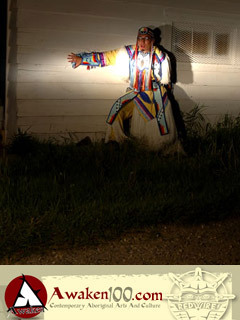 But this was not just any Indian, the Indian that Michael Greyeyes was staging was a living, breathing, three-dimensional, human being rich with fears and desires. Simply put, he was a real person, drinking a beer, telling a story, who also happened to be Cree. Greyeyes went on to candidly discuss †he issue of the burden of representation and stated that “colleagues and friends, sometimes admit in moments of doubt and insecurity that they are inadequate to the task of representing the community…because there is a double-edged sword to those of us of colour, or differing religion, or gender, or orientation, in that, when we speak, we automatically speak for the larger community.” It happens to all of us, at some point, and speaks to our collective burden of representation and that all-too-familiar feeling of being tokenized. According to Greyeyes, Spike Lee knows this all too well. After the release of his 1989 film, “Do the Right Thing”, Lee was criticized for not staging what Greyeyes called “the totality of ethnicity” and his authenticity as a black filmmaker was questioned. Why? Because this film about racial tension in a Brooklyn neighbourhood had a noticeable absence of drugs. Essentially, the dominant white audience fully-expected the storyline of a film set in a marginalized black community to include drugs. 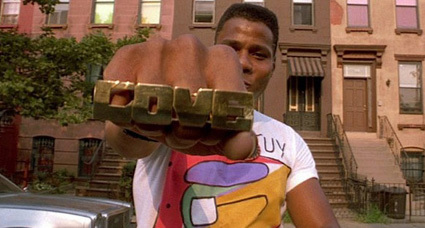 Interestingly enough, the film was set in the very same Brooklyn neighbourhood where Spike Lee grew up. According to Greyeyes this “highlighted something of the staging of ethnicity; that audience expects certain things of us. Call it what you will, I’ll call it our little cross to bear.” In the case of Aboriginal peoples, either we’re too Indian or we’re not Indian enough. “That was really beautiful (beat) and really weird. They staged the native in a profoundly subtle way. Indigenous peoples, have internalized †hose images and accepted them as truths.